The Sheep Whisperer: Sticking Ewe-r Neck out! 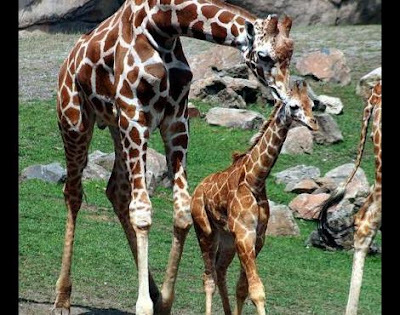 The Giraffe is the tallest living animal on land! These herbivores range in height from 13-20 feet! Giraffes also eat about 70+ lbs. of food a day ! Females weigh from 1500-2600 lbs. & males weigh from 2400-4200 lbs.! They prefer eating in the early morning or the early evening, thus reserving the shade for the heat of the day. It's a long way down, but it's worth it! I have 7 bones in my neck, the same number of bones as humans have! Giraffes live on the continent of Africa, in the sub Sahara region. Giraffes are quite unique in their structure & appearance, having individual spots unlike any other in their species. 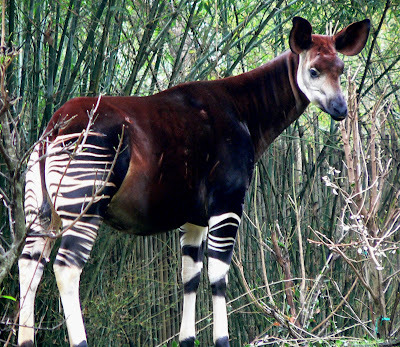 They are related to a much smaller ancestor, the Okapi, also born with a long neck, from Africa's tropical mountain forest. Let me tell Ewe about Ewe-r ancestor, Uncle Opaki! Stop Staring at me! This is how an Okapi is Born! Talk to the Stripe Maker! Giraffes love to eat the leaves of the thorny acacia tree, & due to their height, are able to reach the high, tender leaves. 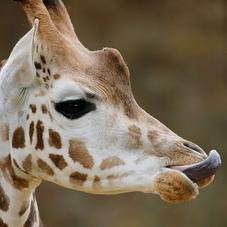 A Giraffe has a hard pad on the roof of its mouth, enabling it to break down the leaves & branches. It also has a 4-chamber stomach, which allows it to store its food & chew the cud. 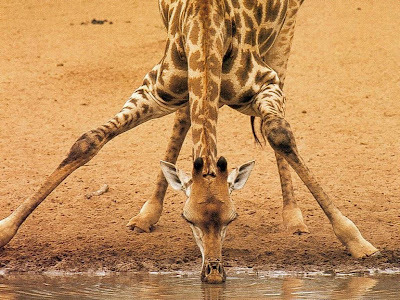 Giraffes can even go without water longer than camels! I'm not sticking my tongue out at Ewe! It's just too long! 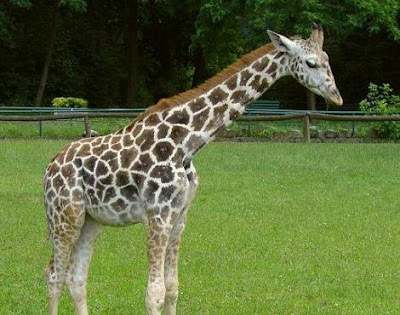 Giraffes have some unusual physical features. 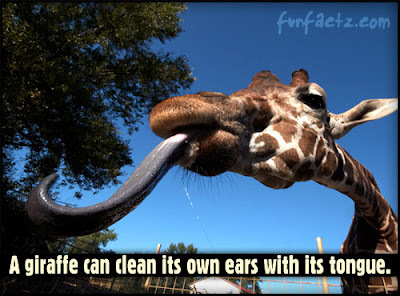 A Giraffe's 21 inch tongue is long enough to clean their own ears! 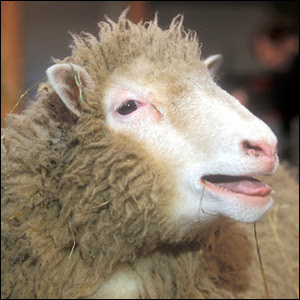 Imagine having a 21 inch Q-tip in Ewe-r mouth? Yuck! Giraffes also have big hearts to go with their huge bodies! Can Ewe guess how big? If Ewe guessed 26 lbs., Ewe were correct! Let's not make any "tongue & cheek" remarks! 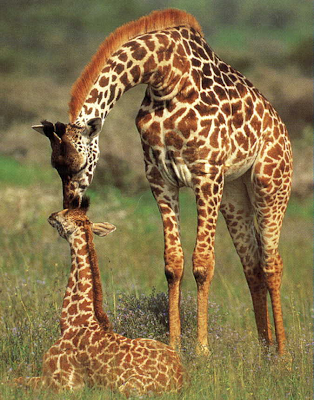 Giraffes gather in herds, mostly composed of mothers & calves. Males do compete for females prior to mating, locking necks & bumping heads until a winner emerges. After the mating is complete, they either do solitary travel or form bachelor groups. Females are then pregnant for about 15 months, before giving birth to a 6 ft. calf! Ouch! She will keep the calf away from the herd for about 2 weeks, & then nurse it for about a year. Ewe have to have Heart, Baby, a really big Heart! I can't kick animals, but I do have a Shepherd who carries a big stick! "Fear not little flock, for it is the Father's good pleasure to give you the kingdom."